And finally, my in-depth reviews for the best, low-maintenance floating plants available today. 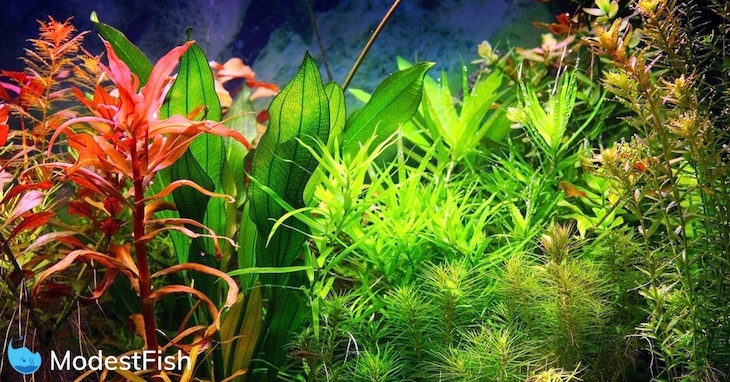 Let’s start by looking why owning floating aquarium plants can be so benefical to your setup. Though most fish-keepers are enthusiastic about adding plants to their aquarium, but, as you probably know, few have the time, money, or green thumb to to do so. Some plants require extra lighting; others have a high nutrient intake. So require more attention. That’s where the magic of floating plants come into play. The majority of floating plants require no extra effort other than the occasional pruning back of overgrown plants. Easy to keep, grow quickly, and are very low-maintenance, you can’t go wrong. Floating plants work to provide shade for your fish. 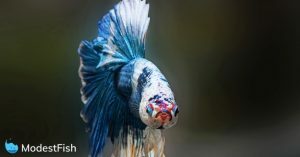 Popular species, particularly betta fish, like lots of shade. Duckweed, for example will work to de-stress your fish, offering it a familiar environment that it finds comfort within. Floating plants like Amazon frogbit also offer a great place for your fish to hide. Dwarf shrimp and krill love to forage amongst the roots of these plants, boosting their wellbeing and quality of life. Additionally, the cover offered by such plants will help to protect your fish from the tank lights during the day. Be careful, covering the entire surface of you tank can starve other plants of light and cause them to die. Floating plants tend to grow very quickly, making them an excellent way of reducing damaging waste from your tank such as nitrate, without any effort on your end. Floating plants consume these toxins as nutrients, efficiently removing them from your tank and helping your plants grow. This saves you the hassle of changing your water every time nitrate becomes an issue. Floating plants can save time and act as a cheap, low-maintenance way to filter your water. 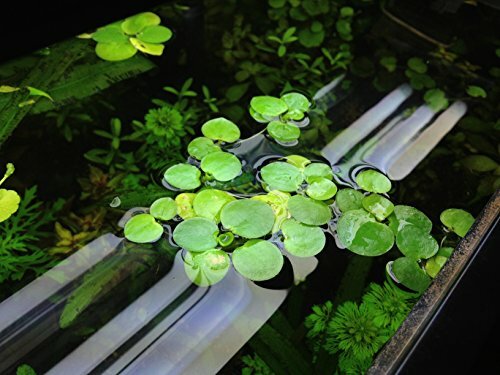 Floating plants can also help keep your tank aerated. Exhaling regularly, oxygen is supplied to your tank which works to improve your pets’ health by providing essential nutrients. That way, the chemistry of your water is kept stable – without the need for expensive filtration systems. 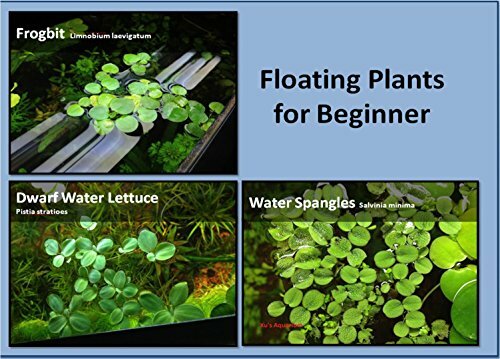 Floating plants grow very quickly, so are ideal for fish who love snacking on live vegetation. Duckweed is a particularly good food source. When you add floating plants to your tank, the risk of your fish being underfed is reduced as they have a second, automated food source. And this food source also adds nutrients that synthetic food may not, helping to balance your pet’s diet. Lastly, all of their health benefits aside, floating plants just look great. They give your aquarium a natural, healthy and realistic look. Not only is this a stylistic design feature, but the natural environment of your tank will work to boost your buddies well-being. They’re naturally hardwired to living in these conditions, so replicating this habitat will reduce stress and boost their overall health. Now you have a clear understanding of what floating plants offer, lets discuss how you can choose the best type for your own setup. What's Living in your Aquarium? Consider what species of fish are in your tank and which plants would be best for them. If you expect your fish to reproduce, plants with roots can provide shelter for smaller, newborn fish, putting them at ease. If nitrates cause frequent problems in your tank, fast-growers like duckweed can help to neutralize toxic substances and protect your fish. Size should also be taken into account. If your tank is under 40 gallons, smaller plants are your best option. 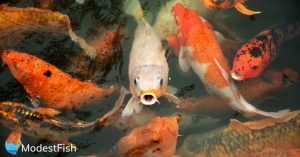 Larger species of vegetation will crowd your fish’s living space and induce stress. Larger tanks, on the other hand, can house several plants and faster-growing varieties. However, it’s wise to take its capacity into consideration before purchasing plants. Though floating plants offer a number of health benefits for your fish, their presence will also change the look and feel of your tank. So it’s important you consider what kind of look you’re hoping to achieve. Long-rooted plants allow shrimp and krill to forage amongst their tendrils, though are likely to fill up the majority of your tank with greenery. If a naturalistic, plant-based haven is what you’re after, most floating plants will work great. If not, be conscious of the fact smaller plants may grow rapidly, and you should choose a plant suited to your aesthetic preferences. Light is another element to consider when adding plants to your aquarium. Floating plants can work well to provide low-light areas for your fish to lounge. They can, however, sometimes be detrimental to the health of plants dwelling on the bottom of your tank. You need to ensure your floating plants aren’t blocking too much light from your LEDs from reaching life below. Some plants, duckweed, can be easy to thin out. Making it easy for you to control light penetration, allowing light to break through and nourish all of your plants equally. Many floating plants grow very quickly. While this is great in terms of cleaning up excess nitrate and providing oxygen, it can also mean that your tank becomes very green, very quickly. Of course, smaller plants should be purchased for smaller tanks. However, even shorter, less-invasive plants can quickly grow to occupy larger areas. That’s why you should consider a plant’s rate of growth before buying it. The faster the rate of growth, the higher maintenance the plant will be as you’ll be required to prune it back regularly. Now you’re got a good idea of the benefits and what you need to consider when choosing your floating plants, you can use the following reviews to make an informed buying decision. Creating a natural, picturesque tank surface. Duckweed is an excellent, easy floating plant for beginners. One of my favourites, duckweed is a great option for smaller aquariums. 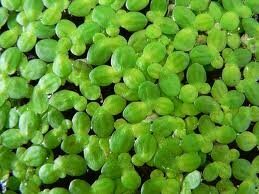 It has very small leaves and short roots, suitable for tanks below 100 litres. Duckweed allows a lot of light to pass through it. It provides a natural, frog pond-like look, forming a picturesque layer of greenery on your water’s surface. It does grow very quickly. So you may need to replace it from time to time, or work to prune back any overgrown roots if required. It’s also wise to keep a lid on your tank before adding duckweed. In many cases, the plant has been known to expand its territory and grow outside of tanks. Such overgrowths can be very difficult to remove, therefore it’s best to prevent this from happening by keeping your aquarium closed. All in all, duckweed is a safe option, a first choice for many aquatic hobbyists, and an effective way to balance your tank’s mineral content. With the option to root or leave them floating, Hornwort plants help oxygenate your water and balance your micro eco-system. Hornwort plants are another common favourite. A species native to Britain, hornworts are able to survive in a range of water conditions whilst preserving their beauty. They form densely packed structures, dark green in colour and allowing fish to hide and forage. Additionally, hornworts can be planted at the base of your tank or left to float freely, growing at a substantial rate. Once fully grown, hornwort can reach six foot in length, therefore pruning is often necessary. This plant also works to improve the quality of your water. Hornworts oxygenate water, removing any excess nutrients and harmful waste products such as nitrate. This can also help to neutralise algae. Hornworts are resilient to cold weather and can be incredibly easy to grow. Sellers recommend purchasing one bunch per square foot of your tank’s capacity. Requiring little attention, Amazon Frogbit is excellent if you need to provide some shady areas. The Amazon frogbit is a classic when it comes to aquatic vegetation. Frogbits sprout long branching roots, their leaves broad and forming large rosettes. Their length is perhaps their most attractive feature among hobbyists, providing foraging fish space to explore. Frogbits do block out a considerable amount of light. This can be particularly beneficial for fish that enjoy lounging in darker areas, such as bettas. It can, however, prove to be problematic for lower-dwelling plants requiring sunlight. 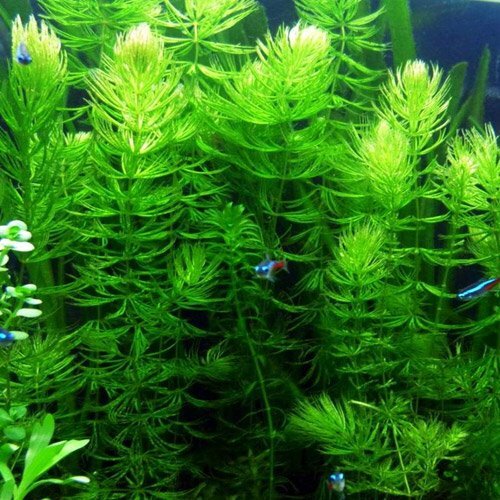 A densely growing plant, it's ideal if you want a wonderful, natural looking background in your planted aquarium. A weed in its native country of America, cabomba plants are pale green in colour and can both be planted or left to float freely. Cabomba caroliniana is a popular choice among fry and shrimp-owners. The plant is densely packed, but also provides openings for smaller fish to hide inside and forage around. Cabombas are suitable for both large and small plants, sellers recommending them for tanks of 5 litres and up. The most popular and easy-to-grow live moss in the aquarium hobby, it's also arguably one of the most beautiful. 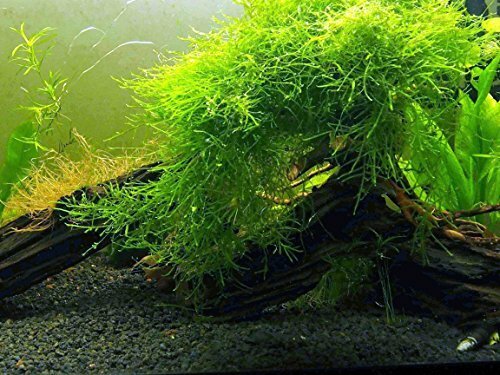 Java moss plants grow along driftwood, rocks and similar surfaces, including rear glass. A densely growing plant, moss contains biofilm, a thin, slimy layer of bacteria that adheres it to surfaces. It also provides hiding places for your fish, as well as security for younger animals. 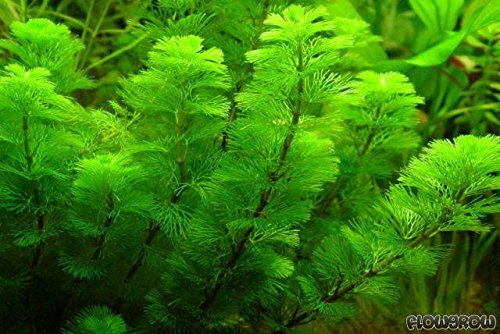 Java moss in particular doesn’t require any special lighting and can be kept in any freshwater aquarium. It is easy to keep and grows at a manageable rate, depending on the amount of light it receives. You have the options to root this plant or leave it to float freely. 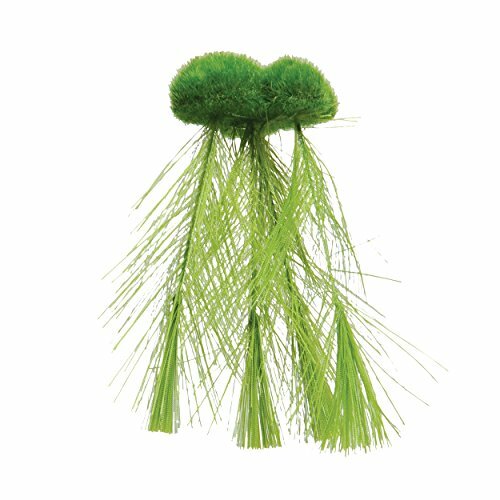 Ideal for indoor and outdoor aquariums, the feather roots provides an excellent place for little fishes to hide and relax. Floating moss is a decorative piece suitable for both tanks and outdoor ponds. This particular floating moss is an artificial plant. 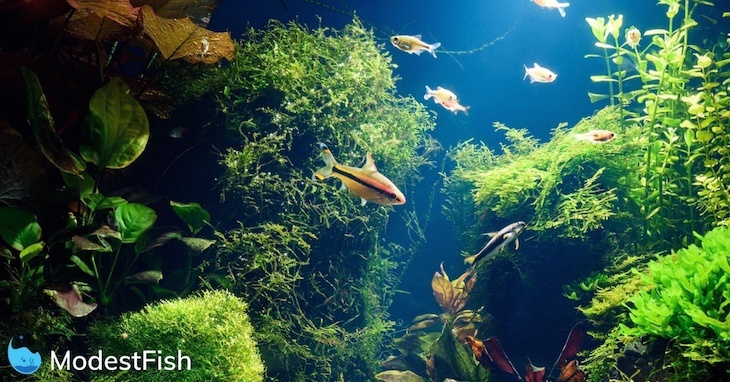 Though it does not offer the same mineral-balancing effects as live plants, floating moss can offer shade for your fish and requires little maintenance. The feather roots of this plant offer a space for smaller fish to hide, an easy way to improve the wellbeing of newborns. Additionally, being artificial, this plant escapes the problems associated with faster-growing, high-maintenance plants. It’s a sound option if you lack the time to prune and maintain your plants. Great for providing shade, it's a hardy plant that requires minimal maintenance. 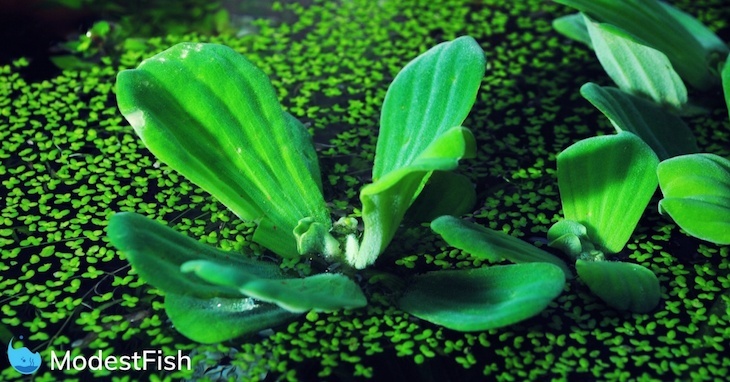 A hardy species of floating plant, it can survive in a number of water conditions. This plant is effective in blocking out sunlight. So will provide shade for your fish, offering them space to hide (a favourite pastime for betta fish). Water spangles also feed off nutrients in the water, acting as a bio-filter that can help to ward off algae blooms. Unsure what you want? Or fancy experimenting? 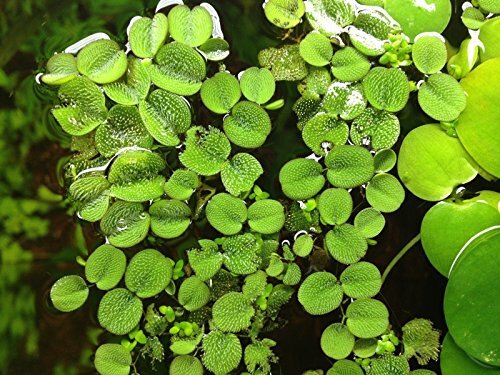 This package offers you a variety of options (12 Amazon Frogbit , 12 Dwarf Water Lettuce, 12 Water Spangles). If you’re undecided on which plant to purchase in particular, they can also be purchased in packages. This package contains dwarf water lettuce, Amazon frogbit and water spangles. Three easy-to-keep plants suitable for all beginners. They say, “some of these plants, including water spangles, do require specialist lighting if kept indoors“. What this really means, is you need dedicated aquarium lighting. Like and LED kit for example. They don’t require substrates or CO2, and can help to neutralize the mineral content of your tank.